So back to this salad. I love cucumbers - continental, lebanese, baby cukes - all of them. One of my favourite ways to eat cucumber is straight up sprinkled with a tiny bit of salt. I usually serve some up with lunch or dinner. I wanted to try and change it up a little. So after a little looking around on the internet I came across this recipe. It was quick and easy and sounded delicious. I could definitely snack on some of this too. I'm very glad I stumbled across this recipe. I did this a tiny bit differently. I didn't drain out the liquid and to make it work as a fresh salad, toss salad in the dressing and serve immediately. If not, it will get soggy. 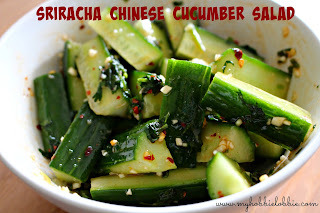 You can make the dressing ahead of time and just chop the cucumber and toss it up just before serving. Mix all the ingredients except the cucumber pieces together in a bowl. Add the cucumber pieces to the bowl and toss well. Hi Trisha! Thanks for your kind comment on my post of pizzelle. I didn't realise you lived in Australia! Yes, you can get a pizzelle iron from Costante Imports http://www.costanteimports.com.au/ in Melbourne. Just phone them ...they are very helpful. A great recipe comes with the machine. Pizzelle are wonderful because they are so easy and can be adapted to many flavours. I haven't done it yet but I think savoury ones would be good. I haven't dropped into your blog for some time. You have been busy! This recipe is great - I love the freshness!